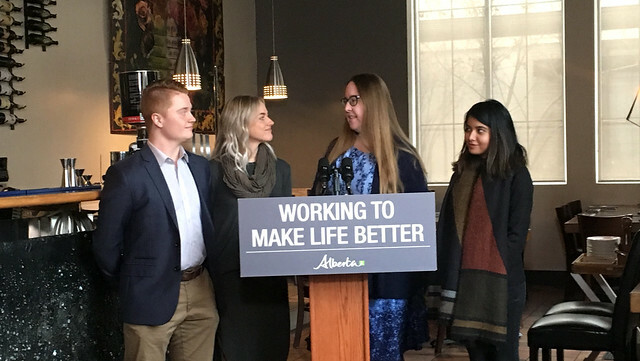 Changes to the Occupational Health and Safety Code will protect the right of Alberta workers to wear shoes that put safety over style. Minister Gray, Lisa Caputo and Cibo staff members celebrate amendments to OHS regulations governing footwear at work. Amendments to the Occupational Health and Safety (OHS) Code by the Government of Alberta will explicitly prohibit employers from requiring workers to use footwear that may pose health and safety risks. The change will provide clarity and prohibit employers from requiring servers and bartending staff to wear high heels. Prolonged high heel use is associated with workplace trips, slips, falls, painful foot conditions and skeletal and muscular injuries. The online survey used for the 2017 OHS system review indicates employers (78 per cent), workers (88 per cent) and health and safety professionals (82 per cent) favour changes that prevent clothing or footwear policies from creating a hazard to workers. In 2017, Ontario and B.C. passed laws banning mandatory footwear policies that potentially create hazards for workers. In 2018, Manitoba passed a similar law.